tl;dr: I like the Fitbit Flex and recommend it. My order for the Fitbit Flex was originally placed in early March, a few days after I’d reviewed the Lifespan treadmill desk I’d gotten for the office. I didn’t get mine until late May, however, the 18th, as Fitbit’s vague “Spring” release for the device almost turned into summer. It was in part because of the treadmill desk that I originally considered a fitness tracker. I was capturing my time on the machine at work, but there was far more activity lost than otherwise. And given my affection for both spreadsheets and making evidence based decisions, devices like the Flex were not a hard sell. Before purchasing the Fitbit, I considered both the Jawbone Up and the Nike Fuelband. What tipped me towards the Flex were two factors. First, the fact that Fitbit explicitly designed for scenarios like the treadmill desk – where you are walking, but your hands remained stationary. This is, at least from reviews I read at the time, a problem for the other two devices. Because a significant portion of my activity per day would be on a treadmill desk, this was a critical feature for me. Second, and nearly as important, was support for the Android platform. Nothing against the iPhone or its users, but I’ve been Android on both phone and tablet for several years now, and I had no intention of switching platforms just for the sake of fitness tracker compatibility. Jawbone has Android support, I believe, but Nike – perhaps not surprisingly as Tim Cook sits on their board – after initially claiming that Android support would arrive last summer, backpedalled and in February committed to an iOS only path. Winner Fitbit Flex, in other words. But not just by default. I’d played with their Android app and their dashboard ahead of the purchase, and found them more than acceptable. Nor has anything in my experience since altered that opinion; I’ve enjoyed the Flex and recommend it. 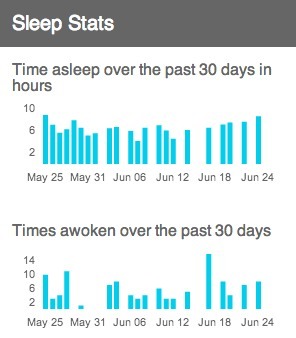 The sleep logging in particular has been intriguing. Fit and Finish: The Flex is a well made piece of hardware. It’s light weight, relatively unobtrusive on the arm and waterproof – meaning that you can basically put it on and forget about it (unless you’re a diver). Removing the device from the wrist sleeve and reinserting it is simple, though putting it back on your wrist is a challenge as I’ll get to. Accuracy: While it has some issues with activity recognition that are discussed below, in general I’ve found the Flex to be remarkably accurate in capturing strides – even when I’m on the treadmill desk. That was one of the first tests I put it through, in fact, and over the three minutes I measured it, the Flex recorded my strides on the treadmill desk more accurately than the treadmill itself. It will occasionally under or over-report an activity, but from my usage the Flex seems to do just what it’s supposed to do: record when I’m moving and how much. Battery Life: With one phone, one tablet, a battery pack and a set of noise-cancelling headphones to keep charged ahead of a trip – not to mention the laptop – good battery life is crucial. I don’t want to have to charge a tracker every day or even every other day, and with the Flex, I don’t. Reviews I read claimed a five day battery life, but I’m consistently getting around seven. I charge it every Sunday night, and then I forget about it until the following week. It’s great. Android Support: As mentioned, the Android support was one of the tipping factors for me with the Flex, and while that’s a selling point, it’s worth mentioning that there’s a caveat. For reasons that are unclear to me, Google has been comfortable ceding the wearable fitness market to both Apple and specific Android partners like Samsung by declining to support, to this point anyhow, the Bluetooth Low Energy / Bluetooth 4.0 standard most devices in this category and others are beginning to rely on. Google, in fact, closed comments on the open issue in June. Even more oddly, a member of the Android team has publicly stated that even older devices like my Galaxy Nexus that have the hardware to support Bluetooth 4.0 will not be getting that support moving forward. Google’s approach here baffles me, frankly, but be advised that Flex’s Android support will not be universal. As I plan to purchase a supported phone eventually, it’s still a plus for me, and Fitbit is to be commended here for at least trying to support Android here, unlike many of their counterparts who are iOS only. 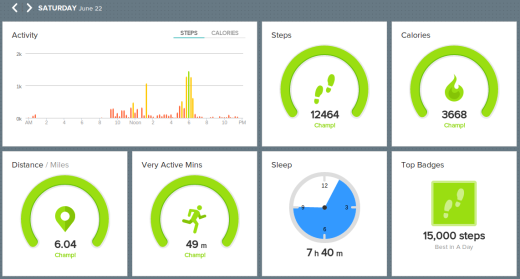 The Dashboard: While the Fitbit dashboard could use some UI help – extracting weekly or monthly history is a particular challenge (look under “Log”) – in general, it’s pretty easy to navigate, aethetically well put together and simple to configure. Activity Recognition: The most common complaint I’ve seen about the Flex is that it’s poor at recognizing different activities, and this is a fair complaint. Setting aside the things it cannot handle at all – like using a sawzall or hammering which bounces it into and out of sleep mode – it rates mowing our tiny lawn as a more vigorous activity than a brutal crossfit-style workout. Which I can assure you is not the case. My hope is that over time Fitbit is able to improve their algorithms to the point that they can make at least an educated guess as to what you’re doing. In the meantime, expect that whether you’re hauling two trees up a steep hill or walking though a parking lot, it’s just going to count the steps. Though to be fair you can enter you activites into the dashboard manually. Band Fitting: Another common complaint is that the wrist band is difficult to fasten, and again this is an accurate statement. The first time I tried to put it on, I almost bruised the inside of my wrist trying to seat the teeth of the band. One trick is to rotate it slightly so you’re pressing into the side of your wristbone, which should have less give than the arteries and veins just south of your hand, and with a bit of practice this becomes a non-issue. Still, it’s an area where Fitbit should and presumably will improve. Timezones: Something of a First World problem is that Fitbit, at least on an automated basis, has no notion of location and thus no idea about timezones. Which means that if you fly coast to coast, for example, the sleep and activity cycles get crossed up such that while walking down 3rd St in San Francisco in search of a late dinner it will register those steps as the first of the day. Not a big deal, but it can skew your data. Elevation: I believe that Fitbit’s non-wrist style devices have on-board altimeters in order to understand whether you’re climbing a flight of stairs, say, but the Flex does not. This would be a welcome addition to future iterations of the product. 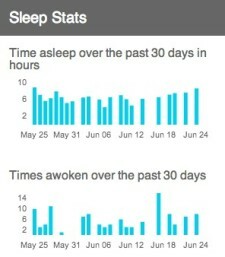 Sleep Mode: Lastly, one of the things I’ve been surprisingly interested in is tracking my sleep. How long I’m sleeping, when I go to bed and wake up, how restless I am and so on. And the Flex is, in general, excellent at capturing that data. The catch is that you have to tell it – manually – when you’re going to sleep and have woken up. Predictably, I forget every so often creating a gap in my data. As with activity recognition, my hope is that the Fitbit can at some point in the near future at least hazard a guess at when I went to sleep and woke up with no intervention from me. The above concerns notwithstanding, I’m comfortable recommending the Flex. It’s been a tremendously useful tool for me in understanding when I’m active, how active I am and if that pattern is beginning to trend in the wrong direction. The only time I take it off a month into this experiment is when I’m doing home improvement work; it just cannot handle the simple act of hammering a nail. It’s not perfect and has some obvious areas for improvement, but it’s more than justified the $99 price tag for my usage. Depending on your needs, and maybe your mobile platform, it might work for yours as well. Interesting. Can it do swimming? Is there any problem to wear “Flex” while working on a laptop? I usually have to take off any of wristbands. Especially with metal parts. For what it’s worth, you can get the Galaxy Nexus to pair with the Fitbit Flex by using a slightly modified apk (install file) found on the XDA forum. I’m using it, and it works perfectly!